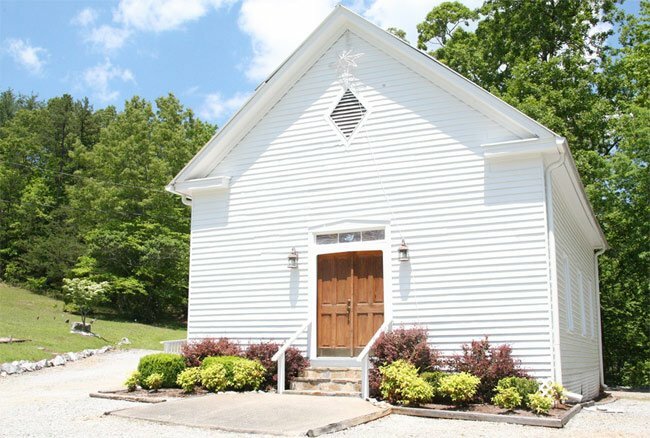 This beautiful chapel in the heart of the Eastatoe Valley (pronounced “EAST-a-tow-ee”) in Pickens County was built in 1891. Though the chapel does not host worshipers weekly, it does offer an ecumenical service on the fourth Sunday of each month. Visiting ministers from the surrounding area supply the chapel with sermons and pastoral care. Though the church is affiliated with Grace United Methodist Church in Pickens, the ministers who serve McKinney Chapel are from all denominations. The chapel is also known for its annual Christmas pageant. Many thanks to contributor Bob Spalding for sharing the above photo and information on this chapel in the valley. The McKinney Chapel Committee or mckinneychapel.com are not the ones you contact about the church; they are a visiting group. Email me at gedwards26@yahoo.com, and I will give you the info. Hi, Leandra. The web address for the chapel is at the top of the map on this page. Good luck! I would like to inquire about having a wedding at your beautiful chapel. Thank you for your time! Hello, Maria. Thank you for visiting the South Carolina Picture Project. Here is a link to the chapel: http://www.mckinneychapel.com/. Hopefully someone there can answer your questions. Best of luck! I would like to inquire about having a wedding at your beautiful chapel. I appreciate your time. God bless!